Want to do your part for the oceans this Earth Day? 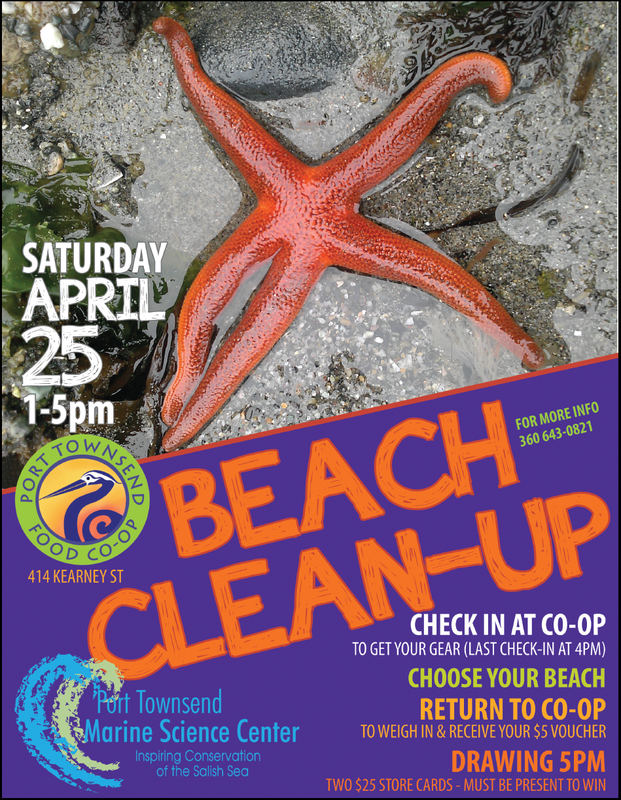 Join the Port Townsend Marine Science Center at the Food Co-op on Saturday, April 25 from 1-5 pm, for an Earth Day Beach Clean-Up! Register at our table anytime before 4pm at the Food Co-op (414 Kearney St. Port Townsend, Washington 98368) and we'll give you materials to collect trash on local PT beaches, assign you a beach, and give you data sheets to record what kind of trash you collect. Once you're done having fun on the beaches, bring your trash back to the Co-op and receive a voucher redeemable at the Food Co-op! Event is family-friendly, so bring your friends, your pals, and other acquaintances that also love to make a difference for our oceans. Go Blue! We also need volunteers to help staff the booth on the day of the event. Set-up begins at 11:30. Contact Amy Johnson, 360-385-5582 x204, if you can help out during the event. Our volunteers are the life-blood of the Marine Science Center. They provide invaluable support in everything we do. Almost everyone who has the willingness and time can find a role as a volunteer that contributes to the organization in important ways. Find out how you can get involved!